The other major listing control to cover is the ComboBox. It turns out that they are almost identical to ListBoxes. This simple code will add a combo box to your container (I’m using a StackPanel) and put two items into it. Running will produce the predictable window with a drop down combo box and two items. If you want the user to be able to edit or enter his own text, you will need to set the IsEditable property to true and IsReadOnly to false in the <ComboBox> header. Also like the ListBox, the ComboBox can contain complex items. Note from the image above, if the contents of the drop down are too big it wil drop below the bottom of your current Window. Additionally, if you use automatic sizing the combo box will adjust itself rather oddly depending on the contents. For that reason, you may wish to set a default width rather than letting the combo box do it for you. So how do we get data back out of the ComboBox? Well, if all we have is text, we can do just like we did with the ListBox, convert the selected item to a combo box item and get it’s Content.ToString property. But what if it’s like the above example, a mixture of text and images? Well we have to dig just a little, but it’s not that difficult if you understand the tree WPF creates. Note I made two changes. First I added a name to the ComboBox, that way I can address it in code. Next I added a simple button control, we’ll use it to show what is currently selected. Just for the fun of it, I used the Content tag instead of placing it between the <Button></Button> tags, you may run across that form of syntax at some point and should be aware of it. Now we need to add a little code to the myButton_Click event. First, I got the current ComboBox item, and stored it in the cbi variable. 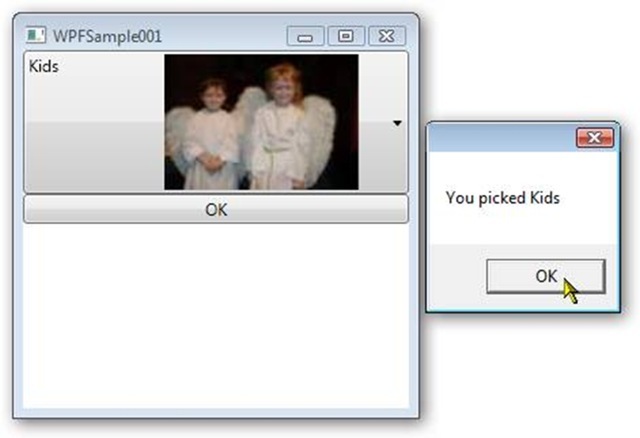 I then check to see if it’s null, which it will be if the user hasn’t selected anything. If it is, we can show them the traditional “hey dummy” message, as I did in the else clause. If you recall, the contents of the ComboBoxItem are a StackPanel control, so next I get a reference to it in the sp variable. Next, I suppose I could iterate of the Children of the StackPanel, but since I know that the TextBlock I want is the first child, I’ll simply reference it directly as element zero and return it to the block variable. The same techniques I use here would also be applicable to the ListBox we’ve seen previously, simply replace ComboBoxItem with ListBoxItem. The WPF ComboBox can be quite useful for providing a compact way for users to select complex items. How did you make the combo dropdown button to be a custom color, matching the background color of the textblock area? I wonder if you could guide me on how to make a new control in WPF. Basically I need a ComboBox that not only display a list, but display a grid with information from a SQL query. This component in VB6 was called TDBCombo, and you could especify wich query columns were visible and invisible. But I have to make it in .NET and use it in my apps. 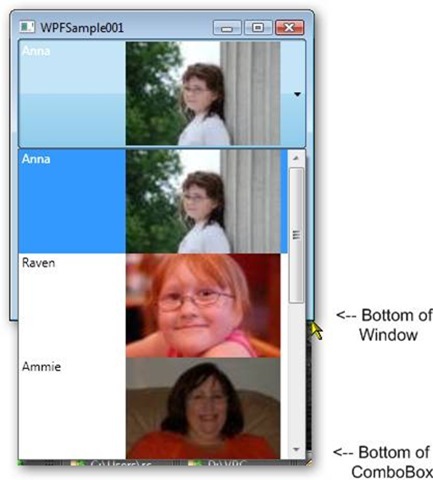 Thank you Very Much, this has become my Best material in WPF ComboBox topic. U made this very simple. I have found another post related to this post over internet. Post link..
i want to add the multiple item values in combo box from database and display when particular item is selected …..